This hostal, located at the Eixample of Barcelona and in front of the Arc de Triomf, wants to offer what people who travel today want. So, with that premise, we recovered the old structure and gave it light, color, life. 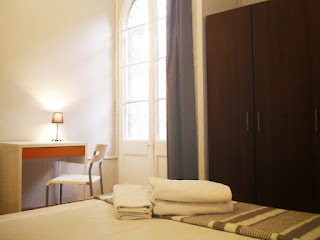 Three colors represent the mix of this elements all around the hostal. White, for the light. Warm gray for the color. And orange for life. A life that fullfills all the hostal, and guides the traveler during the trip. We took advantage of the existing rooms and common areas structure, but also created new ones. Result, an interesting range of rooms and equipment, that allows the hostal to increase and diversify it's offer. The hostal is also an art space, and its walls become canvases for permanent and temporay exhibitions of youg artists, as MCLima, panamanian painter, who has contributed to fill of art this place.